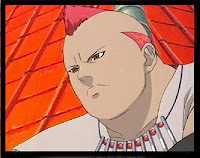 Jirobo was the third member of the Sound Five, Jirobo is drawn into battle with Choji Akimichi during the Sasuke Retrieval arc, who he calls fat near-constantly during their battle. He also compares Choji to a pawn that is sacrificed so that the stronger members of the team, the knights, can survive. These statements, as well as Jirobo's insults of Shikamaru Nara, causes Choji to utilize his trump card, drastically increasing his strength. 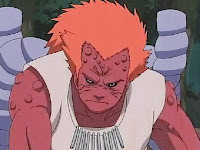 Despite Jirobo's best attempts, Choji's strength outmatches his own and he is killed with a blow to the chest.